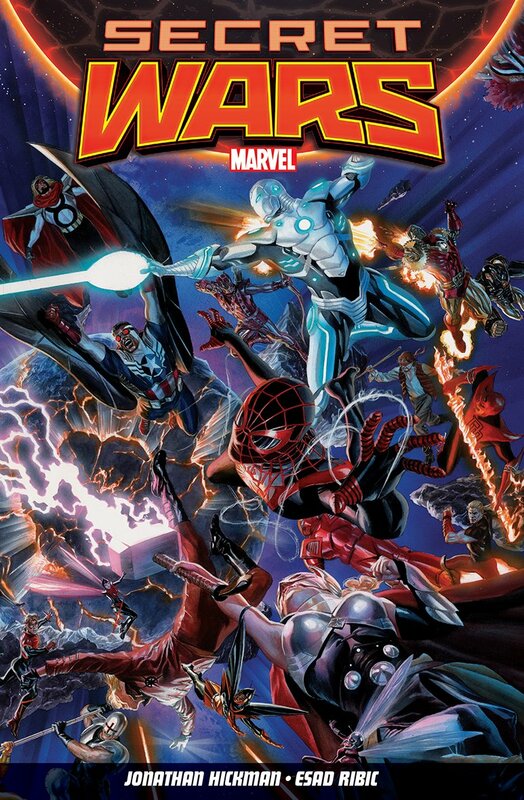 SECERT WARS is many things, amongst which it's the culmination and climax of a storyline first set in motion by Hickman in his FF / FANTASTIC FOUR run then NEW AVENGERS VOL 1.
or everything died in both. As the book opens there are now only two Marvel universes left: the regular and the Ultimate. The Earth of each appeared in the other's sky, blotting out almost everything else up there. Their populations were terrified and their respective superhuman populations went straight on the attack without knowing for the most part that they were essentially up against themselves. The good news is that Reed Richards, having seen this coming for months and failed to find an acceptable solution, came up with a contingency plan instead and, along with his equally erudite daughter Valeria (still aged seven or something! ), constructed a life raft they believe could withstand the death of the universe. It could contain no more than 60 individuals - Reed's immediate family, some, scientists and superheroes. The bad news is that as existence blinked there was a catastrophic hull breach and only a handful of heroes made it through. The others simply ceased to exist. "Quarantine is for things that cause doubt." A new day, a new dawn, and if there are fewer stars then at least there are a lot more Thors, each wielding an enchanted hammer forged from one of the missing celestial bodies. (Got to love legend! Ignorance is the mother of invention!). They are the keepers of the law, the Hammers of God. They kneel below their omnipotent deity. Is it the All-Father, Odin? By sheer force of unflinching will - and a certain source of power - Doom has salvaged from both universes what he can and created a composite world of multiple kingdoms from incursion point remnants between which access is verboten unless strictly authorised or summoned for judgement. Judgement proves swift and rarely merciful. Beware which kingdom you're banished to! 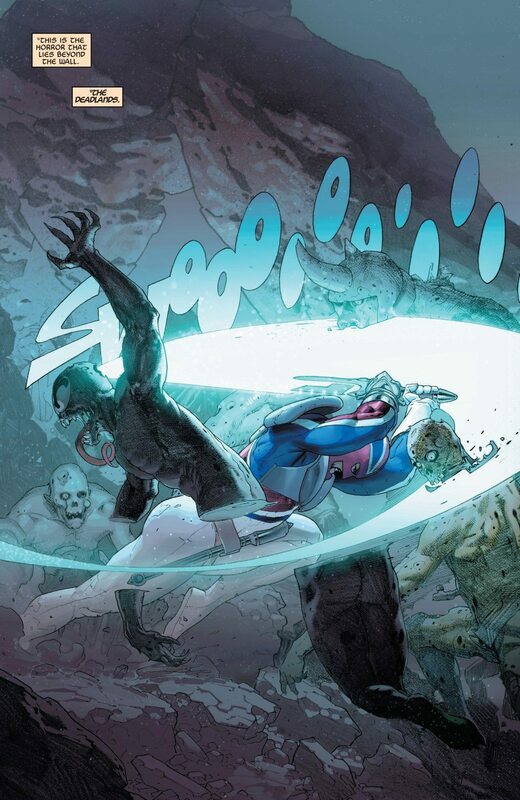 Many are key Marvel events playing themselves out differently; others are populated by superhero or supervillain zombies, the seasonally migrating Annihilation Wave or Ultron A.I.s kept at bay by the enormous Shield. At the centre sits Lord God Doom on his throne, the World Tree Yggdrasil. His right hand of justice is Sheriff Stephen Strange who baulked at the prospect of so much power but is the only one other than Doom to remember the past and know this world's secret: that it is not a naturally occurring phenomenon but a construct. To say so is heresy. 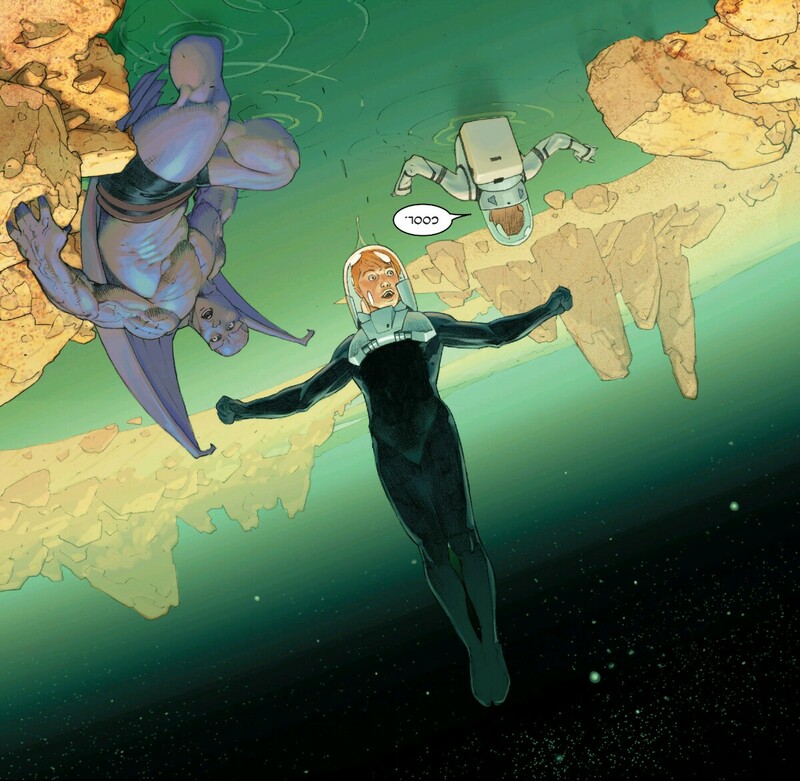 To his left is Valeria, daughter of Doom's wife Susan Storm and head of The Foundation of science and discovery. What they have discovered is this: an anomaly. A thing which might cause doubt: something which must be quarantined. What do you suppose that is, eh? Okay, I've given you enough, I hope, to raise your eyebrows. Half the fun - very much like Neil Gaiman & Andy Kubert's MARVEL 1602 - will be discovering for yourselves you favourite characters cast in a new light under utterly alien circumstances but with a considerable degree of logic in their new assignations based on their past shared history. This is far more complex than your average summer event, and prettier too with sweeping Euro-sci-fi sequences like Minister Powers' investigations, and vast Ribic landscapes like the Isle Of Agamotto, its epic hidden chambers boasting beasts bearing secrets and gifts on their tongues. Ribic delivers the best portrayal of Sinister I've ever seen. His expressions are so priceless you'll find yourself acting out the dialogue in your head. Sinister is jubilant, aloof, dismissive and cross; he's mock-cross, goading and gleeful. He's basically Tim Currie. In one panel he positively dances his way to a judgement whose authority he'd never recognise nor submit to in a million years. Don't know who Sinister is? It really won't matter. Towards the end a major battles between two individuals goes representational, totemic, and Ribic pulls that off with aplomb. I loved that Doom is omnipotent but not omniscient, for his power may have expanded, but not his mind. 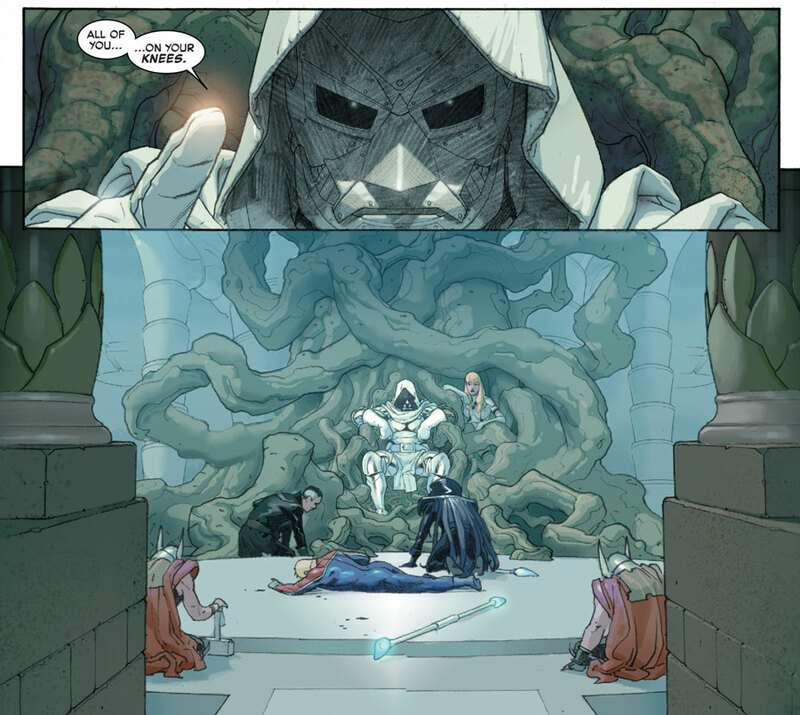 I like Stephen and Valeria as Doom's "duelling ideologies" and adored how the survivors interacted with the salvaged, tentatively testing each other out for truth. 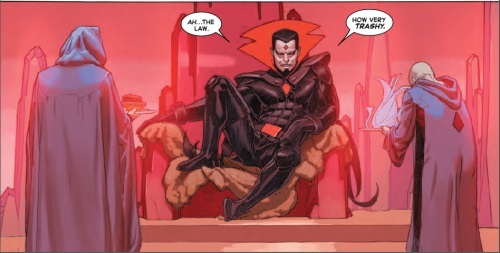 Other little things like Advanced Idea Mechanics becoming the equally seditious Advanced Idea Mythologies; the Black Panther's role as king of the dead finally coming into play and line like this from Namor when a weapon makes itself known: "Don't look at me. We both know I can't be trusted." The epilogue sequences revisiting the genesis of this storyline were enormously satisfying and the final sentence, answering a much older one, note-perfect. 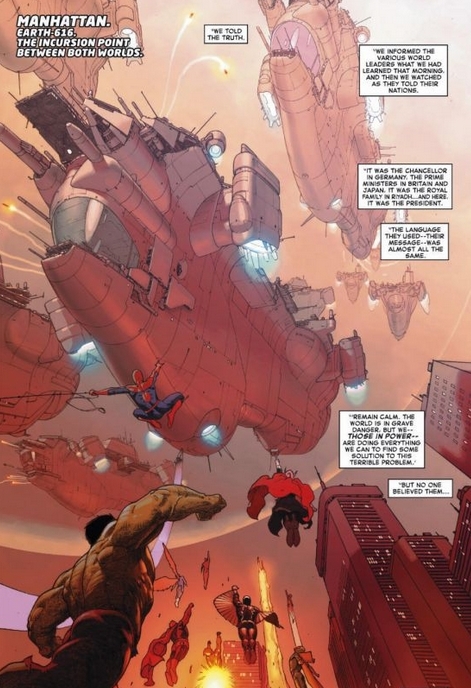 I've a feeling Hickman had that planned from the start. Smart move to use capital letters for the regular Marvel Universe castaways and lower case for those washed ashore from the Ultimate Universe whose comics have always used lower case. "I'm sorry...? There are survivors from the Ultimate Universe?!" Why yes. 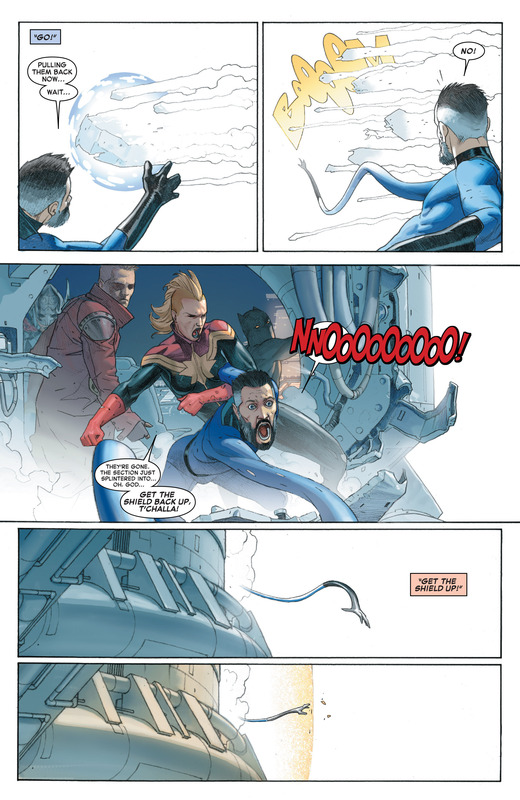 For if one Reed Richards has a contingency plan, then surely the other would too? The UK softcover and US hardcover both include the prologue originally published after the first issue, but while the softcover leads with this, the hardcover incorporates it as a bonus in the back. Both editions contain vast quantities of cover / pin-up material. The softcover, since it comes from Panini, inevitably has ugly design flaws between chapters which wake you up from your reverie, but is half the price and - and at over 9 longer-than-usual chapters long - exceptional value for money.